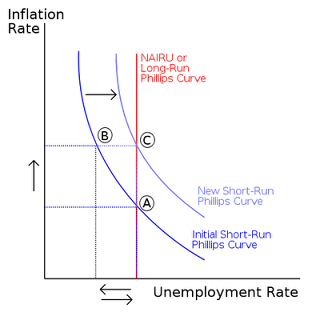 A vertical Phillip's curve shows that their is no trade off between inflation and unemployment - FreeEconHelp.com, Learning Economics... Solved! 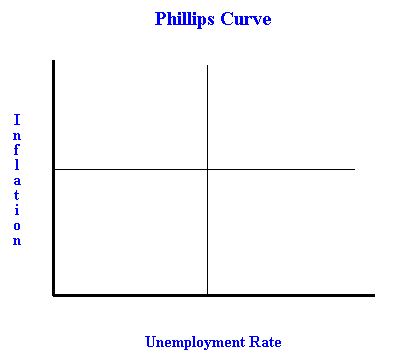 A question was recently asked: If the Phillips curve is _____ in the long run, there is no trade-off between inflation and unemployment in the long run. 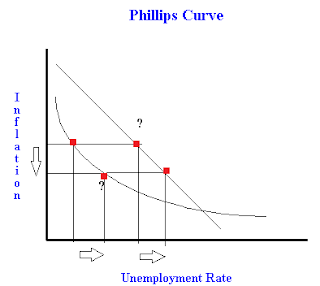 In order to answer this question we will have to understand two things, how to graph relationships between two variables, and what the Phillip's curve looks like. 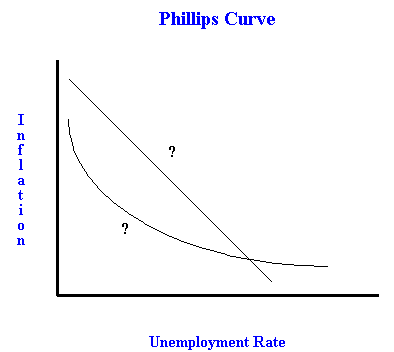 The Phillip's curve attempts to show the theoretical relationship between the inflation rate, and the unemployment rate in an economy. The two have a significant relationship if we change one of the variables, say inflation, and we see that this causes a change in unemployment. Lets test this idea on the graph to the left to see if we can come up with any sort of relationship given those two curves. You can see in the graph below, that when we lower the inflation rate, we increase the unemployment rate. So with these two examples (both showing negative relationships), there IS a tradeoff between inflation and unemployment. Whether the line is concave or convex doesn't matter either, because a concave curve bows out, and a convex curve bows in (see the post on PPFs for a discussion of curve shapes). 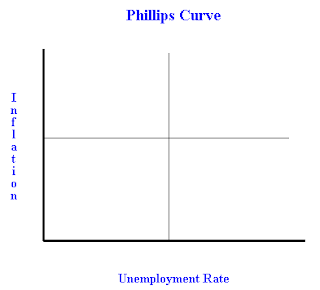 The only way to draw a line on this Phillip's Curve graph that shows no tradeoff between inflation and unemployment is to draw a line that is vertical or horizontal. If you look at the graph below, you can see that as we change either inflation (if the line is vertical), or unemployment (if the line is horizontal), we see no change in the other variable. 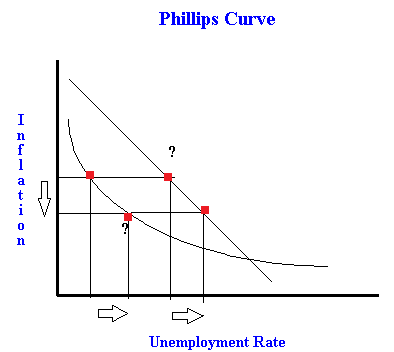 So the answer to the problem, is that we need a vertical curve for the long run Phillips curve, in order for there to be no trade off between inflation and unemployment. 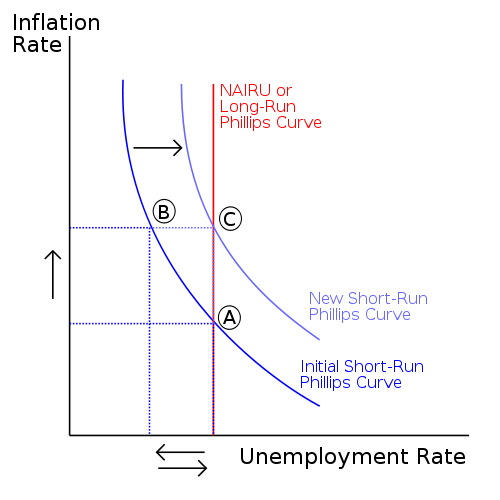 An example of this can be seen from a Phillip's curve graph, that shows the difference between a short run curve (negative convex to the origin relationship) and a long run curve (vertical). What the vertical curve tells us is that in the long run unemployment is fixed, but can be influenced over the short run but enacting policies that change inflation. This is believed to be the true order of things by most economists, because they believe that there is a "natural" unemployment rate that we tend to stay at over time with fluctuations in between. 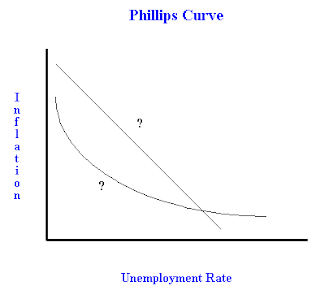 Remember: The long run Phillip's curve should be vertical, meaning that the unemployment rate is fixed at the "natural" level over the long run. In the short run however, we do see a trade off between inflation and unemployment (and it is a negative relationship).